E-commerce giant Amazon doesn't think brick and mortar retailing is dead, and has been slowly growing a fleet of physical stores. While the company's acquisition of Whole Foods has grabbed headlines, the company's physical footprint has reached beyond grocery sales and these efforts could dramatically shape how retail operates in the very near future. While Amazon is the unquestionable world’s leader of e-commerce, the company is intent on growing a physical presence throughout the United States with the introduction of retail stores. While e-commerce has enjoyed 20 years of rapid growth, selling over the web still only accounts for less than 10 percent of total retail sales. “Pure-play Web retailing is not sustainable,” says New York University marketing professor Scott Galloway. The term is called ‘omnichannel selling’, which leverages a company’s assets by blending web stores, mobile apps and physical stores in order to sell more products to more customers. Amazon has a large distribution system, a data-rich network of customers and broad, market-influencing purchasing powers. 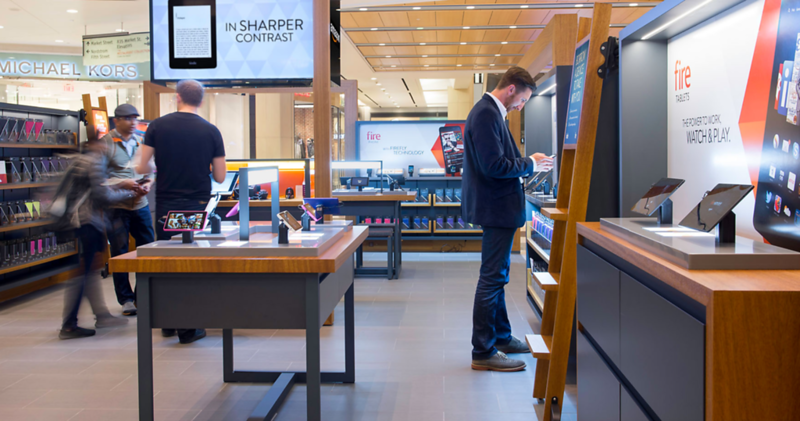 Armed with these advantages, the company has begun to recognize the strategic value of integrating brick and mortar stores into their selling channels. Although Amazon is beefing up its physical footprint, these efforts won’t exactly result in a product that looks the same as their traditional retail counterparts. The following offers a snapshot on how the world’s largest e-tailer is becoming a physical retailer. Are shopping malls dead? Amazon doesn’t think so. The company currently operates 51 pop-up stores in malls throughout the US. Developed in tandem with experiential marketing firm EWI, these storefronts or kiosks are typically between 300 and 500 square feet in size. 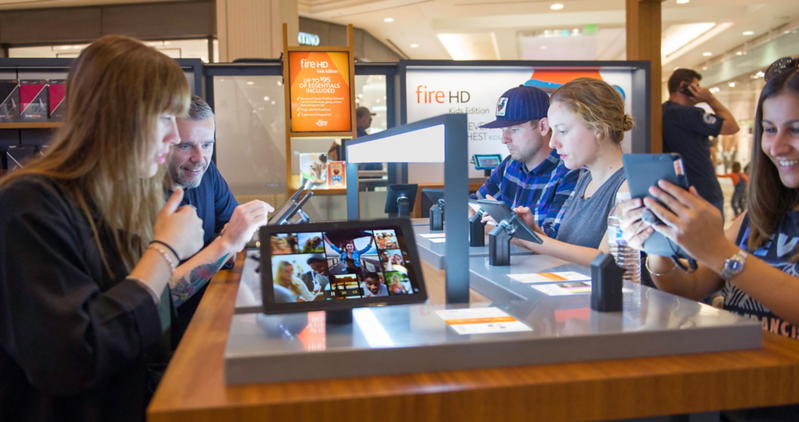 Each storefront carries a selection of Amazon devices such as the Echo, Fire TV, Fire Tablets and Kindle. 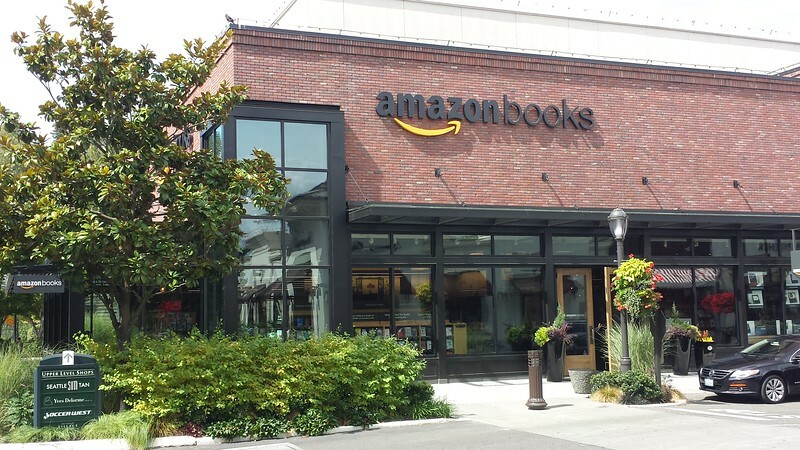 These Amazon Pop-Up stores are staffed with Amazon employees that are eager to discuss Amazon services like Amazon Prime, Kindle Unlimited, and Amazon FreeTime Unlimited as well as in-house produced digital content from the Amazon Original Series. The broader goal is to drive more traffic to Amazon’s online store, and the in-store product mix all make it easier to purchase more items on Amazon’s web store. If these spaces look like an Apple store, then that may be by design. Apple embarked on a strategy more than a decade ago to bypass selling products solely through big-box retailers, and instead open a series of smaller retail locations where the company could sell directly to consumers. Apple stores became widely popular, and highly-trained, in-store associates successfully drive in-store traffic back to Apple’s digital channels. According to Wall Street Journal, Apple’s annual retail sales per square foot are some of the highest in the nation, surpassing ultra luxury retailers like Coach and Tiffany. 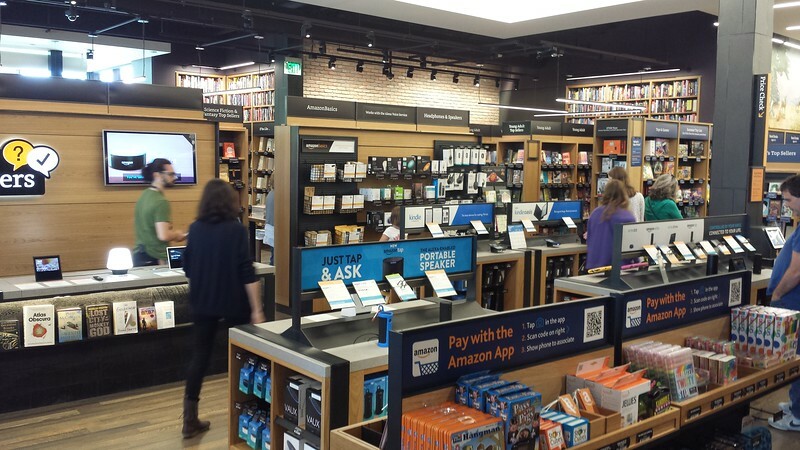 Launched two years ago, ten Amazon bookstores now operate from coast-to-coast. This new physical presence into the bookstore world is not all that surprising when one considers that Amazon sells about roughly one-third of all printed books, and two-thirds of all e-books purchased in the United States. 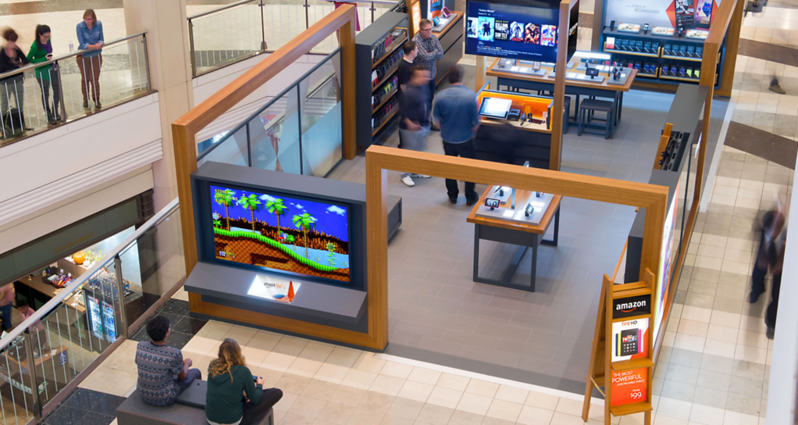 These storefronts average about 4,000 sq ft in size (the average Barnes & Noble is 25,000 sq ft), and leverage Amazon’s access to customer reviews in order to create a highly curated experience. About 3,500 titles adorn the shelves of each store, all displayed with their covers facing outward just like how a thumbnail image of each product is displayed within Amazon’s web store. But look below each book and you’ll find a placard that displays the book’s Amazon star rating along with an excerpt from an actual Amazon customer’s review. All books for sale here are rated 4 stars and higher. Just like Amazon’s recommendation engine online, display shelves also feature a ‘If you like this, you’ll love this’ selection of books. The bookstore also gleans insight into the company’s push to market and increase its Amazon Prime membership by offering a staggered pricing model based on Amazon customer’s profiles. Prime membership costs $99 annually, or $10.99 per month, and allows online users to receive perks like free two-day shipping and unlimited streaming of movies and TV shows. In the bookstore, Prime members can purchase products at the same price that they sell for online. While non-Prime members can still shop at the physical bookstore, they’ll pay actual list price (the ‘suggested retail price’ provided by a manufacturer). Oftentimes, the list price can be 20-40% higher than the price of a book sold online at Amzon.com. According to CEO Jeff Bezos, Amazon intends to open 300 to 400 bookstores nationwide.